The HTC Desire 626 ticks all the right boxes on paper, but it can't back them up in practice. It's a solid phone, but it's unexceptional in almost every area, and can be bettered without spending any more cash. Update: HTC is no longer stocking the Desire 626, but it does still supply the phone to carriers and retailers around the world. It means you'll likely be able to find the HTC Desire 626 at a cheaper price, especially in the UK. It's getting hard to keep up with HTC's Desire range, with so many handsets arriving and just a three-digit number to tell them apart. The HTC Desire 626 is a successor to the HTC Desire 620, and while its forgettable name doesn't do it any favors there's a lot to like here, at least on paper. For one thing the specs have had a significant upgrade, with a better camera, more RAM and more storage all included. Yet you won't pay much of a premium for the Desire 626, which comes in at £169.99 (US$179.99, around AU$257), making it just £20 (roughly US $30, AU$40) more than the Desire 620. 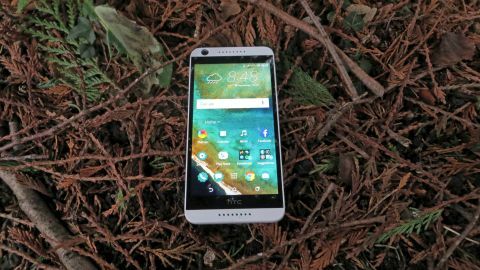 HTC is no longer stocking the Desire 626 in the UK either, but you can get it a little cheaper from some retailers for around £155. It ticks a lot of boxes too, from its 5-inch 720p screen to its 13MP camera and customisable interface. All of which marks it out as a clear rival to the similarly well-equipped and almost identically priced Motorola Moto G4. Which is no bad thing, as Motorola's phone is one of the best budget handsets available. But there's more to a phone than specs – it needs to deliver on those specs and come together as a cohesive whole, so does the HTC Desire 626 manage that? I received two versions of the HTC Desire 626 for review: one with a funky light blue edge sat between a dark blue front and rear and another slightly more understated model, with a light brown edge sandwiched between a shiny white front and back. The two-tone colour scheme is nothing new for HTC, which rolled out a similar design on the likes of the HTC Desire Eye, and a more premium metal-clad version for the HTC One M9. It's not a bad look for a budget phone, especially the blue version, but the soft-to-the-touch plastic feels smooth to the point of being a little slippery and doesn't provide a huge amount of grip, while both colours pick up visible fingerprints and smudges. The phone also feels slightly creaky. Not like it's going to break, but as though there hasn't been a huge amount of care and attention put into its construction, as it flexes slightly and makes creaking sounds when it does. Still, the rounded corners and soft-touch feel ensure it sits fairly comfortably in the hand. It's also possible to reach all the buttons without having to adjust your grip much – and I say that as someone with quite small hands. I found the button placement took some getting used to though. Both the volume and power buttons are on the right edge, but the volume buttons are above the power key, which never feels natural to me. They are at least very different sizes, so your fingers can easily find the right one, and after a couple of days I started to get used to the position, but it never quite felt right. While the Desire 626 is small enough to hold one-handed it's not as compact as you might expect for a 5-inch phone, as there are large bezels above and below the screen. These are necessary in part to house the speakers, but as with other HTC phones there's also a black strip just below the screen that has no obvious function. Don't be fooled by those speakers either. They might look like BoomSound ones, but only the bottom one is actually used for media, and while it can pump out a decent amount of volume there's none of the crispness you get from HTC's pricier handsets. Unlike with some plastic phones you can't remove the back of the HTC Desire 626, which means there's no getting to the battery. There's a cover on the left edge which can be slid away to access the microSD and SIM card slots. As the Desire 626 has been upgraded from the 8GB of storage in the Desire 620 to 16GB here a microSD card isn't quite so vital, but it gives you a lot more room to manoeuvre.